Brendon Burns is an Australian comedian touring the Netherlands shortly as part of the “Greg Shapiro presents…” series. I had the pleasure of talking with Greg recently at the Feel At Home in The Hague Fair, and bought his great new book “How to Be Orange“. Hilarious and a separate blog post coming soon. A regular at the Edinburgh Fringe Festival since 1996, he won the top prize there in 2007 and has a long list of performances and live recordings. If you’re an Australian in The Netherlands, now’s your chance to see him perform in October. 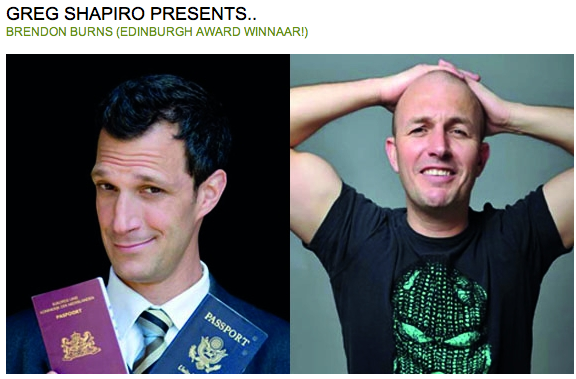 You can see the full Greg Shapiro presents Brendon Burns schedule and order tickets here. Did you see me in that video? I’ve seen him a few times here in Amsterdam and already have my tix for the Almere show. He’s really great. Confronting and a bit in your face, but great! Highly recommended. As is Greg Shapiro, of course.